What Is “Host Process for Windows Tasks”, and Why Are So Many Running on My PC? If you spend any time poking around through your Task Manager window, you’ve probably seen a process named “Host Process for Windows Tasks.” In fact, you’ve likely seen multiple instances of this task running at the same time. If you’ve ever wondered what it was and why there are sometimes so many, we’ve got the answer for you. What Is It and Why Are There So Many in Task Manager? Host Process for Windows Tasks is an official Microsoft core process. In Windows, services that load from executable (EXE) files are able to institute themselves as full, separate processes on the system and are listed by their own names in Task Manager. Services that load from Dynamic Linked Library (DLL) files rather than from EXE files cannot institute themselves as a full process. Instead, Host Process for Windows Tasks must serve as a host for that service. You will see a separate Host Process for Windows Tasks entry running for each DLL-based service loaded into Windows, or possibly for a group of DLL-based services. Whether and how DLL-based services are grouped is up to the developer of the service. How many instances you see depends entirely on how many such processes you have running on your system. On my current system, I see only two instances, but on other systems, I’ve seen as many as a dozen. Unfortunately, Task Manager gives you no way to see exactly what services (or group of services) are attached to each Host Process for Windows Tasks entry. 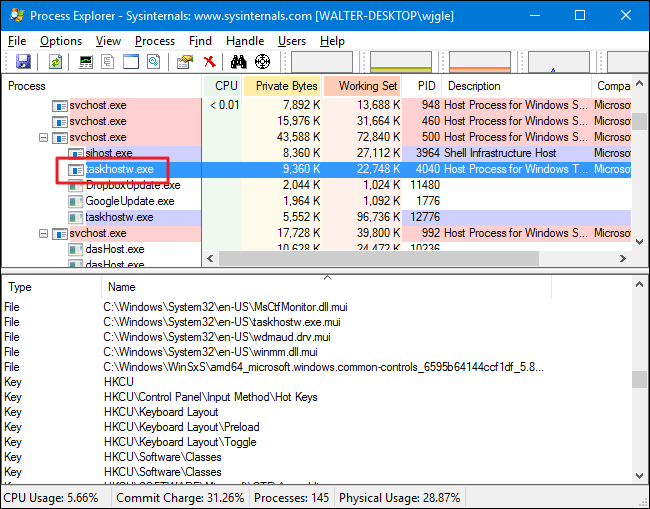 If you’re really curious to see what each instance is linked to, you’ll need to download Process Explorer, a free Sysinternals utility provided by Microsoft. It’s a portable tool, so there’s no installation. Just download it, extract the files, and run it. In Process Explorer, select View > Lower Pane to be able to see details for whatever process you select. Scroll down the list and select one of the taskhostw.exe entries. That’s the file name of the Host Process for Windows Tasks service. Looking through the details in the lower pane, I’m able to piece together that this service is linked to my audio drivers and also has Registry keys associated keyboard layout. So, I’m going to assume it’s the service that monitors for when I press any of the media keys on my keyboard (volume, mute, and so on) and delivers the appropriate commands where they need to go. Why Does It Use So Many Resources at Windows Startup? Typically, the CPU and memory each instance of Host Process for Windows Tasks just depends on what service the entry is attached to. Normally, each service will consume the resources it needs to do its job and then settle back down to a baseline of activity. If you notice that any single instance of Host Process for Windows Tasks continually uses more resources than you think it should, you’ll need to track down which service is attached to that instance and troubleshoot the related service itself. 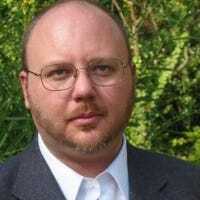 You will notice that right after startup, all instances of Host Process for Windows Tasks may look like they’re consuming extra resources–especially the CPU. This is also normal behavior and should settle down quickly. When Windows starts, the Host Process for Windows Tasks scans the Services entries in the Registry and builds a list of DLL-based services that it needs to load. It then loads each of those services, and you’re going to see it consuming a fair bit of CPU during that time. No, you can’t disable Host Process for Windows Tasks. And you wouldn’t want to anyway. It’s essential for being able to load DLL-based services onto your system and, depending on what you’ve got running, disabling Host Process for Windows Tasks could break any number of things. Windows won’t even let you temporarily end the task. The process itself is an official Windows component. While it’s possible that a virus has replaced the real Host Process for Windows Tasks with an executable of its own, it’s very unlikely. We’ve seen no reports of viruses that hijack this process. If you’d like to be sure, you can check out Host Process for Windows Tasks’ underlying file location. 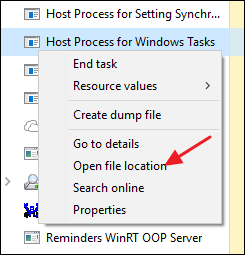 In Task Manager, right-click Host Process for Windows Tasks and choose the “Open File Location” option.